Thank you for stopping by the Gobbling Up the Giveaways giveaway hop hosted by The Anti-June Cleaver and Our Piece of Earth. We have teamed up with an amazing group of bloggers to bring you a lot of fantastic of prizes to kick of the holiday season. After you have entered my giveaway, be sure to visit the linky below for more great prizes. With Veterans Day just a few days away, it's the time of year that many are looking to give back to the men and women of the armed services to thank them for all the sacrifices they have made for their country. Individuals can do that by buying a veteran lunch or a simple thank you, but its not just individuals who want to say thank you, but companies as well. Companies like- Meineke and Maaco! But it's not just this one veteran they're thanking! Both companies are also having fantastic Veterans Day deals for all military too! Meineke will provide free basic oil changes for all veterans at participating locations! This is a deal that just about every veteran could use isn't it? And for the car fanatics looking to give their own vehicle a little makeover, Maaco is offering 20% paint services with a military ID (active,retired,reserves). 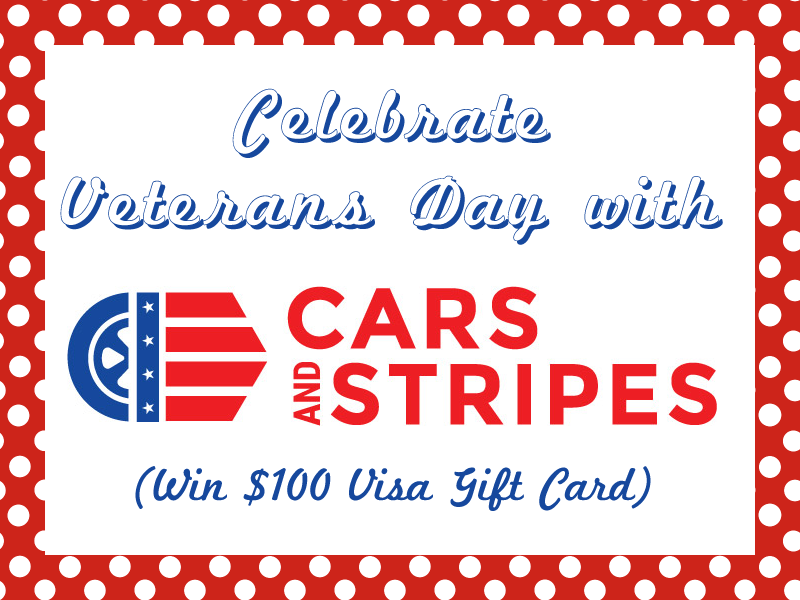 These great promotions are sure to be a hit with all car loving vets, and are certainly worth checking out! Winner will be contacted via e-mail after giveaway ends, and will have 48 hours to respond before a new winner is chosen. One entry per household, winning entry will be verified. Odds of winning depend on valid entries received. A Modern Day Fairy Tale is not responsible for prize delivery The Anti-June Cleaver, Our Piece of Earth, and the rest of the bloggers participating in the Fall Fun giveaway hop are not responsible for sponsors who do not fulfill prize obligations. Both my dad and grandpa are veterans! I will have to tell them about all the Veteran's day deals. Thanks for the chance! I would love to win something in this great giveaway hop! It's nice the businesses celebrate the military with discounts or something free. They deserve it. I love companies that show support and offer discounts for Veterans! What a fun hop this is! What an awesome way to honor and support veterans. I am always happy to shop companies that support veterans. This is so amazingly generous of them!! Wow!! How absolutely fantastic!! This is such an awesome giveaway! Thank you for participating in this hop and for the opportunity! I love companies that offer discounts to our Veterans or free services. I know my Grandpa always makes sure to participate and he appreciates it so much. This is amazing!!! I can't wait to see the finished product! I wish more companies were like this! Btw... what an amazing giveaway!! This is an amazing hop that supports an amazing and an important cause! I love to see all this support for our veterans. Thank you. So happy to see the Veterans remembered and beautiful Hallmark cards too. It would be so nice to win this so I can buy Christmas presents. Thank you for the great giveaway chance! Bless you and your family this holiday season! Thank you so much for the giveaway! I love blog hops! I love to see this support for our veterans. What an great way to honor and support veterans. I so appreciate Veterans and their bravery! I'm proud that my nephew is going into the Marines after graduation. I respect veterans and active military members AND their families. This money would sure help with the electric bill. My thanks goes out to all of our veterans! Thanks for the giveaway...and thank you to everyone who has served and who will serve! My father was a veteran. This is a great giveaway!! I heard many radio commercials advertising the free oil changes for veterans. I hope many of them were able to take advantage of this. It's a small way to say thanks. I appreciate companies that give back to our Servicemen and women! Thanks for the fun blog hop! I have only used Meineke's services once but they did a great job! This was a nice thing they did for vets. My father is a veteran who lost an eye. I definitely believe that we should do more to help them, support them, and honor them! I thank all the veterans for their service to keep our country safe and I totally support them and their families! What a fantastic program to support our troops and veterans. I think more companies should do things for our Vets. This is such a great thing. I love that these companies are helping to support our veterans. Very cool. Wow, this is awesome that they give a truck to a veteran in need. I really like that they give back.